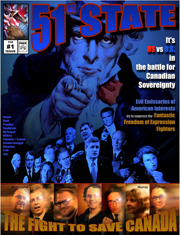 Gordon Duggan of Appropriation Art has created a remarkable comic book [PDF – 2.8 MB] chronicling the recent battle over Canadian copyright reform. The book includes over 100 links to websites, articles, and other resources as every quote or reference is hyperlinked. It concludes with references to groups actively involved in copyright issues and suggestions for how to get active. This left me absolutely speechless. You didn’t realize that the neo cons really are wannabe republicans. They want to be just like george , part of that free masonic illuminati rich boys club. Thing is they can’t be unless the sell out there own people. I was also blown away by this. Great work! Good to see people out there care enough about issues to take the time and create something that looks good and tells us a great truth. Yes a freakn comic…what a brilliant idea!!! The only thing un-American about it in my view are the laws it is describing to us. When did America stop becoming the land of the free. We are the land of the free, and it appears our freedom is so much a threat to groups in the US (I am not referring to the American people here, but politicians and bearcats) that they feel the need to once again interfere and pressure us to adopt their policies. Even worse, our “New” Canadian Government laps it up. Is it just me or does anyone else feel their sense of Canadian pride is being eroded by all this? If being a douche means caring enough about what you believe in to educate and entertain others about an issue…..then you may count me as one too!